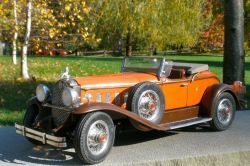 This 1930 Packard 7-34 Speedster features a scratch built body, wheels and trim on a shortened 1/18 scale Hubley Duesenberg platform. The body is carved rom wood, except for the opening metal hood. 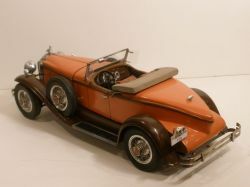 There is a replica of the straight eight L head Packard engine under the hood. The wheels are turned on a Taig micro-lathe and threaded with 56 nichrome wire spokes each. The trim is brass, plated using the Caswell "brush" electroplating system with their "copychrome" solution. 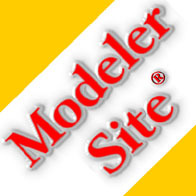 The listing format didn't give me the choice of 1/18 scale which this model is, being based on the 1/18 scale Hubley platform.